Create a CUSTOMIZED SXSW ITINERARY with the Yr SXSW Planner! Download FREE MP3s of SXSW-bound bands! If you are scratching your head and wondering what SXSW all about is let us to a quick review of the company known as SXSW. SXSW Inc. is a company that plans and runs various events such as conferences, trade shows, and festivals. There are three main South by Southwest festivals the company runs concurrently for ten days during the early spring (March) in Austin, Texas. Initiated in 1987, SXSW film, interactive, and music festivals have continued to grow in size every year. SXSW claims that their is the largest music festival of its kind in the world. Featuring more than 100 venues and over 2,200 performers and bands over a period of six days, there is no lack of music. As with any event of this scale, over the years history has been made with the discovery of bands that would one day become legendary, signing of unknown musicians, tribute concerts, surprise performances, and of course controversies. Throughout it all, however, there was always great music. SO buy your tickets and come on down to the greatest music festival in the world, SXSW!! And if you are unable to attend there will be plenty of You Tube videos posted of performances and you can follow the day to day events via twitter and facebook. If you want a break from the music (which we can’t imagine), you could always drop in to the concurrently running SXSW Film and SXSW Interactive events. There’s no better place on the planet than SXSW to kick off a year’s worth of activities supporting independent radio. Yaris and Free Yr Radio welcome you to Yr SXSW, an online resource to make your SXSW 2008 better than ever. There are so many activities to do this year. Stay tuned and you’ll hear all about em! Yaris and Free Yr Radio will also be broadcasting music live from the streets of Austin in partnership with Minnesota’s The Current! Check out our SXSW Broadcast Schedule for more info. And if you’re in Austin be sure to take a ride in one of the free Yaris shuttles. 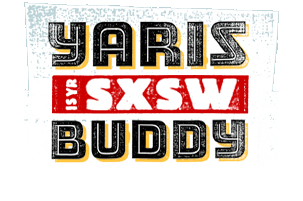 In Austin or anywhere, it’s Yr SXSW, made possible by Yaris.